We started with complex multirate structure, with five tax slabs — 1%, 5%, 12%, 18%, and 28%. In November 2017, GST rate was slashed from 28% to 18% on over 170 items, followed by pruning of the list further in July 2018 and then in January of this year. While there are still few items (like cement), besides those contemplated initially, it’s only a matter of time that rate on these items will also come down to 18%. Structurally, this should also pave the way for simplification of the rate structure possibly from five slabs to possibly three over next couple of years, with likely convergence of 12% and 18% rate to a standard rate of 15% to 16%. 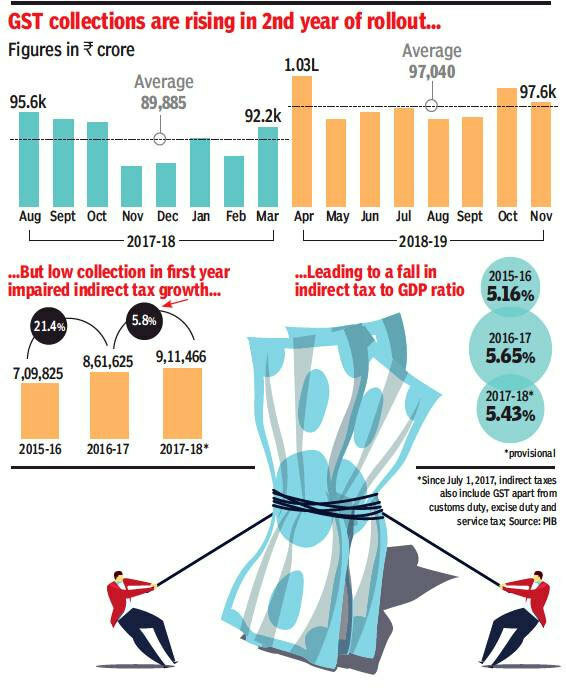 The GST collections have not been as buoyant as government expected. Substantial rate cuts and relief to small taxpayers mean that there would be pressure on exchequer. This would mean that larger businesses may be scrutinised with more rigour and the wealth of data, which is available to the government, may be used to check tax evasion .